They are both great companies, but which one is the smarter choice for investors today? Healthcare giants Pfizer (NYSE:PFE) and Regeneron Pharmaceuticals (NASDAQ:REGN) have both been great investments for long-term shareholders, and each has outperformed the market over the past five years (albeit one just slightly more than the other). But which one of these two healthcare companies is the better buy today? Let's stack up each of these companies against each other to see if we can ascertain an answer. While both of these companies easily qualify as a large cap, with a market cap of $183 billion Pfizer is currently several orders of magnitude larger than Regeneron Pharmaceuticals. That size difference could also expand considerably in the coming months if Pfizer's pending $160 billion takeover of fellow pharma giant Allergan is approved. If it does, Pfizer will become a $300 billion-plus megagiant. Still, Pfizer's huge comparative size is a bit of a double-edged sword. On one hand, its increased scale and product diversification helps to bring stability to its financials, which might make Pfizer's stock an attractive choice for investors who are looking for a company that offers predictability. On the other hand, Pfizer's tremendous size might make it increasingly difficult for the company to grow much more, so investors with a longer time horizon who are looking for more upside might find the opportunity inherent in Regeneron's smaller size to be more attractive. Pfizer has had a tough time growing ever since it lost patent protection on its top-selling cholesterol-busting drug, Lipitor, in 2011. In fact, sales have been declining for several years in a row now and have fallen nearly 25% over the past five years. However, thanks to aggressive cost-cutting efforts and a huge share-repurchase program, the company's earnings per share have actually increased over that time frame, albeit at a low-single-digit rate. For the next five years, analysts expect the company's earnings per share to grow by roughly 5%, though that could change if the Allergan deal is completed in the second half of the year. Regeneron, on the other hand, has been an absolute tear over the past few years. Revenue has surged at a 62% annualized growth rate over the past five years. That huge growth has come almost entirely on the back of its best-selling drug, Eylea, which treats a variety of eye-related diseases. Regeneron also recently launched a cholesterol-busting drug of its own -- Praluent -- which holds blockbuster potential, and it has another two promising drugs in late-stage trials. Add it all up, and analysts see Regeneron continuing to grow its bottom line at nearly 20% annualized over the coming five years. Given its modest growth rates and prospects, the market is only willing to pay roughly 14 times Pfizer's trailing earnings right now, which is a below-average multiple. Pfizer's value price has pushed up its dividend yield considerably, and its shares now yield more than 4%. By contrast, Regeneron's stock has managed to capture growth investors' attention, and they've bid up the company's shares to reflect its rosy future. Regeneron is currently trading at an eye-popping trailing P/E ratio of more than 70. But, if you're willing to look forward one year and use 2017 earnings estimates, that number drops all the way to 24. Another valuation tool that investors can use to shed some light on these two companies is to use the PEG ratio, which divides a stocks P/E ratio by its future growth rate. In general, the lower the PEG ratio, the better. Although Pfizer has a lower P/E ratio right now, its modest future grow rate gives its stock a PEG ratio of 2.37 right now. By comparison, Regeneron's superior growth rate gives it a PEG ratio of 1.68, so this metric could indicate that its stock is a better value -- an interesting contrast to a simple P/E comparison of the two companies. Which is the better buy today? Deciding which of these stocks is the better choice for you depends largely on your investing style, life situation, and time horizon. Investors such as retirees looking for a reliable dividend payer would likely find Pfizer's stock to be the better option, while someone who is after growth will likely give Regeneron the edge. 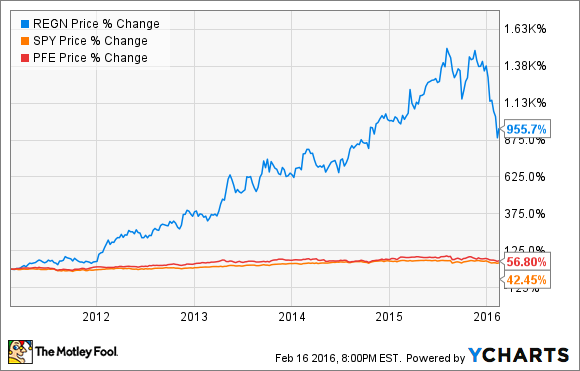 Personally, I like Regeneron Pharmaceuticals stock more right now. The company has positioned itself nicely for strong growth in 2016 and beyond, yet the recent market decline has caused traders to mark down its stock by more than 30% from its recent high. That could hint that it's a good time for anyone who is looking to add a fast grower to their portfolio to give Regeneron's stock a closer look.